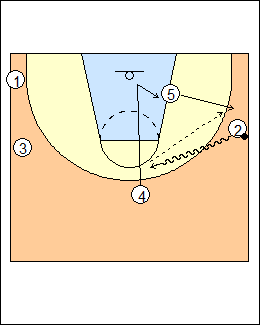 In "clear" sets, the point guard hits the ballside wing and cuts (clears) weakside. These plays can be used in a high-low offence, see Offences - High-low, Carleton Ravens, 1-4 Dive series, also Kowakczyk ballscreen. 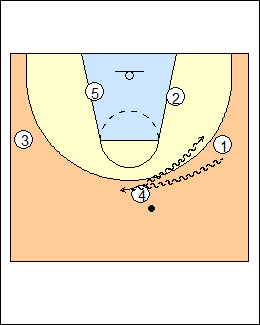 In the first set of plays, the point guard passes and clears to the weakside corner. 2 passes to 4, 3 takes a step toward the ball, backcuts and cross-screens for 5, 1 comes up for a pass, 4 downscreens for 3 (triangle motion). 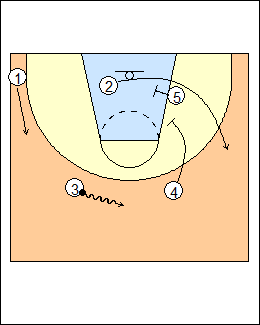 See Offences - 1-4 Dive series (Eagle), Kowalczyk ballscreen (Screen the screener), Fast breaks - Spurs 2007 (Weak). 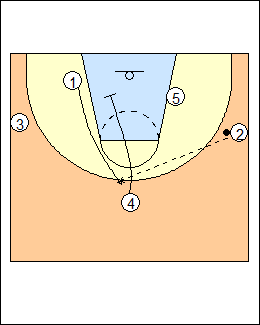 Option - 5 runs into a pick and roll with 1. 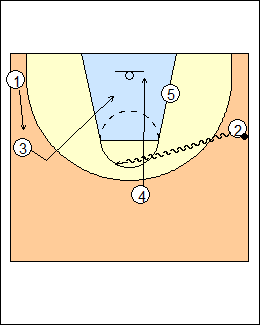 See Offences - Nets (Cross-get), Dribble-drive ballscreens (Thru). See Offence - Flex specials (Pitt series), Quick hitters - Pitt. 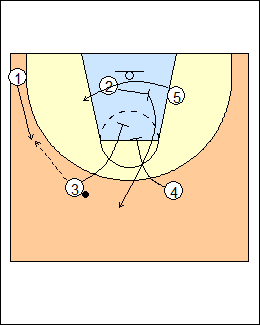 4 catches in the slot, 5 backscreens for 2, 3 gets open for a pass. 1 comes up, gets a pass, 2 turns to cross-screen for 5, 3 and 4 downscreen for 2. 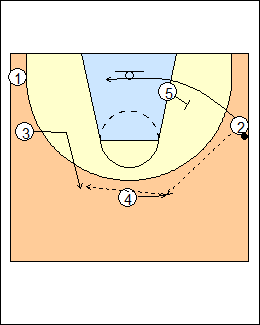 3 dribbles middle, 5 and 4 stagger screen for 2. 3 throws back to 1, 5 turns and screens for 4 (misdirection). 5 comes up to the elbow for a pass, 2 follows looking for a handback, 5 attacks right. 4 screens away to occupy defenders. 4 screens for 3 to get open. 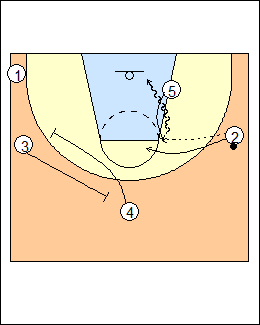 2 passes to 3, 5 comes up to pick and roll, 4 replaces 5, 1 fills behind as 5 rolls (look for 1 if X1 helps on the roll). 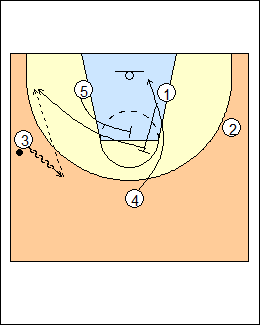 2 passes to 3, 4 comes back out to pick and roll, 5 replaces. 2 dribbles at 4 who backcuts, 5 empties to the perimeter, 2 looks to make a pass to 4 on the backdoor cut, or pass to 5 for a shot or pass inside to 4. 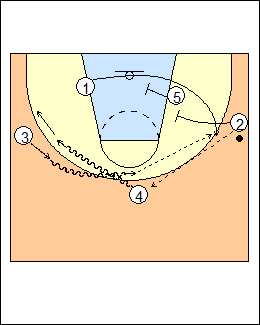 See Offence - Denial counters (wing-to-guard). 2 dribbles at 4 who backcuts, 3 steps to the ball and also backcuts, 1 lifts for a pass. 2 passes to 1, 3 posts up for a pass, 5 and 2 stagger screen for 4. To run the post-up for 4, put him on the left wing to start. See Offences - 1-4 Dive series (Huskies, Nets (denials), Seth Greenberg slice (Five), Kowalczyk ballscreen (Hook post), Quick hitters - Cavs pistol series. 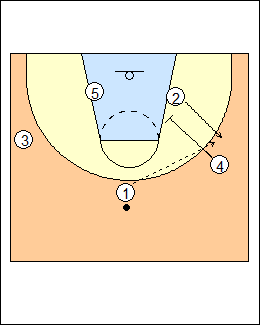 In the second set of plays, 1 cuts to the weakside short corner. 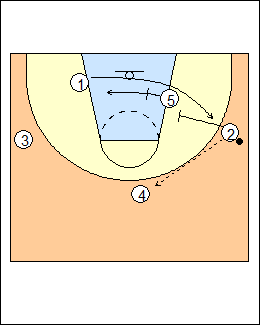 2 passes to 4, who makes a dribble handoff to 3, 5 and 2 stagger screen for 1. 3 hits 1 coming off the stagger. 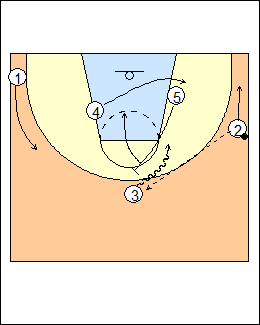 See Offence - !-4 Dive series (Cougar), Fast breaks - Versoix specials (Cougar). 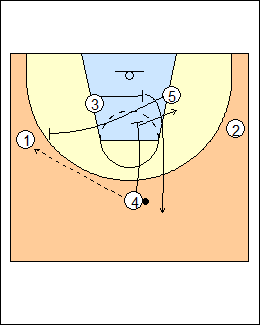 3 throws back to 4 for a post feed to 5 inside (misdirection). 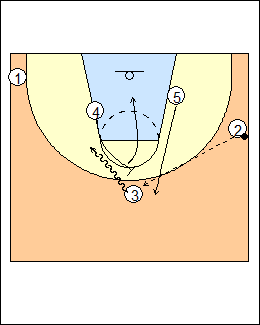 2 passes to 4, 5 and 2 stagger screen for 1. Dribble handoff from 4 to 1. 4 downscreens for a throwback to 2 for a shot. 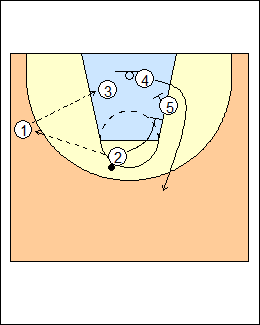 See Fast breaks - Larry Brown (Drag, Drag hold), Xavier (Drag). The ball is reversed, 1 cross-screens for 5. 3 dribbles middle if 5 isn't open, 1 backscreens for 4, 5 sets a turn-out screen for 1. 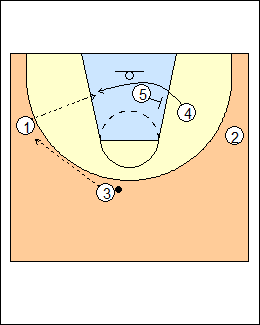 After 1 cuts weakside, 4 downscreens for an isolation play. See Quick hitters - Duke actions (Release), also Offence - Dribble-drive ballscreens (Vandy).